This is something for the writers among my readers – but also for the fans of Neil Gaiman and Margaret Atwood. I’ve taken a few of the Masterclass (writing) classes because I’ve got the all-access pass since last year and thoroughly enjoyed them. Some of the newer instructors are Margaret Atwood and Neil Gaiman. While I mostly enjoy Margaret Atwood’s class, I absolutely love Nail Gaiman’s storytelling course. The material is inspiring and he’s just such a wonderful person. Since these are new classes, I thought it might be worth mentioning them. If you have any questions about Masterclass or certain classes, just ask me. Since I’ve taken a few – not only on writing -, I can certainly give you my opinion and some advice. I’m slowly reading all of Neil Gaiman’s novels. I just love the way he combines the familiar with the uncanny and Coraline, a deliciously creepy tale, is one of the best examples of this ability. I often think I already know a Neil Gaiman story or novel when I begin reading it, but then, all of sudden, half-way in, he twists the story and what seemed like something I’ve read before turns into a new and highly original tale. Reading Coraline reminded me of the discovery of Narnia in C.S. Lewis’ book and it also reminded me of Alice in Wonderland. Only the land that Coraline explores isn’t a wonderland, it’s dark, creepy territory. Coraline is a small girl who has moved into a new apartment with her parents. The apartment is in a big, old house, surrounded by a vast garden. In the apartment below Coraline’s live two former actresses, in the apartment above, an old man who pretends to have a mouse circus. Coraline is bored. The family moved in during the school holidays and Coraline has no friends in the new neighbourhood yet. Her parents are kind but always busy and distracted. At times it seems they wouldn’t even notice if Coraline was gone. Then Coraline discovers the door and through that door she enters a reversed world. It’s the same apartment house, the same people live in it. Only things seem more beautiful at first. There are doubles of her parents and they are much more attentive. There’s a black cat that can speak. It’s the same black cat Coraline saw in her own world, only there it wasn’t able to talk. When Coraline notices that the eyes of the other mother and father are made of buttons, and when she realizes that the other mother wants her to stay, she knows this world is a sinister place. Will she be able to return to her own world? Will the black cat help her? And what about those ghost children? Will Coraline be able to free them? 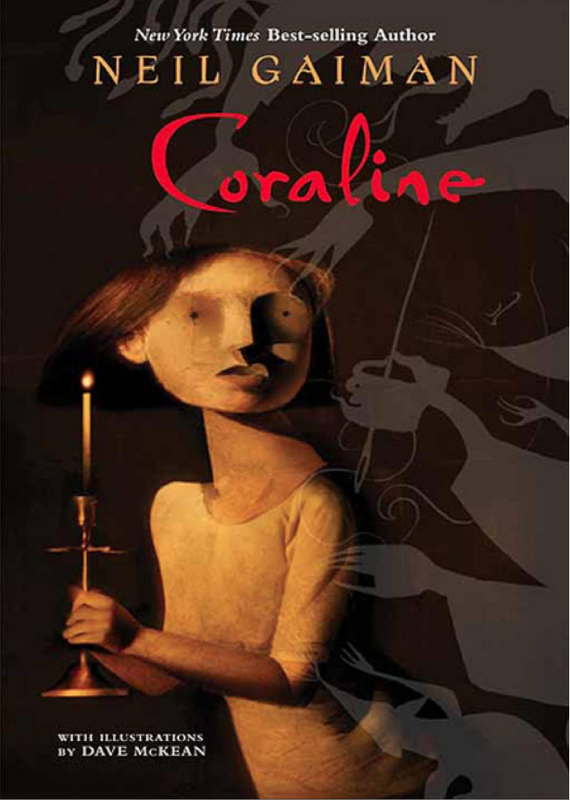 What I loved best about Coraline, is how it got darker and darker towards the end. At first it seems a simple tale of a lonely girl finding another, better world that looks almost identical to her own, but then, slowly, she discovers more and more unsettling elements— rats who carry keys, snow globes with little people in it, button eyes, dead children and a lot more. The best element comes towards the end. Unfortunately I can’t write about it, or I would spoil the fun of reading it for the first time. There is one thing that bothered me though. I’m not fond of black cats in fantasy novels, especially not when they have a few negative traits. This one is a helper but it has a lot of creepy characteristics too. There are too many countries that are superstitious of black cats, and, as long as this is the case, I find the use of black cats highly problematic. Halloween is upcoming, and, like every year – it’s a terrible time in many places for black cats. I would have wished he’d not used a black cat. 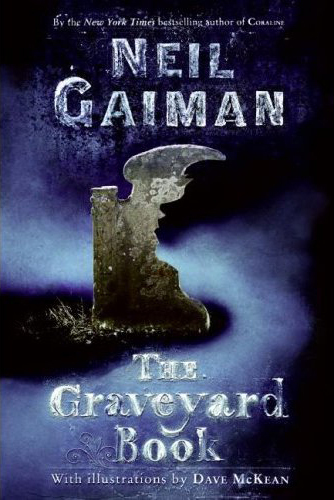 I wrote at the beginning that Gaiman combines familiar and unfamiliar elements. He uses stories we all know, but he also combines realistic descriptions of everyday life with fantastical elements. Coraline’s boredom, the way her parents treat her —kindly but without fully acknowledging her — is done very realistically. I haven’t seen the movie yet, but now, with the weather turning more autumnal, I feel like watching it soon. Last week I wrote about chapters 4 – 6 of Neil Gaiman’s The Graveyard Book, this week we have read the final chapters 7 and 8. It was obvious that the man Jack would be back and also that he would be part of the final episodes. What wasn’t entirely clear but was revealed in the final chapters was why he was after Bod’s family. This is where The Graveyard Book turns almost into a Greek tragedy. In order to prevent something that is predicted, the man Jack commits a crime but, as is the case in the Greek tragedies, fails and the murder itself sets in motion his own undoing. Ironic really. The final confrontation with the man Jack was something I expected and I wasn’t too surprised, still there are many surprises in the final chapters. I was wondering from the beginning how the book would end in terms of Bod’s development and future. Would he forever stay with his ghost family and friends? Would he start to follow Silas on his trips? Would Miss Lupescu show him how to become like her?All these were possibilities and I was keen on finding out which solution Gaiman had chosen. The end isn’t exactly like I expected it. I thought it was almost a bit sad. I know, I’m allowed to, as this is a readalong post, still, I don’t feel like spoiling the book, so I won’t say more. There is something I like about Neil Gaiman’s books and stories and that is that he often provides a lot of information on how he his novels and stories came to be, what inspired him, where he wrote them. As I said in my first post, The Graveyard Book is strongly influenced by The Jungle Book but one of the very first inspirations came, as he writes, from watching his then two year-old son riding his tricycle between the graves of a cemetery. He finally started the book with chapter four and if his daughter hadn’t wanted to know what would happen next, he would have stopped there. Tori Amos is one of the people he mentions in the Acknowledgment section. He also adds some lines from her song Graveyard. I can only assume it inspired him too. It’s a very short piece. You can listen to it on YouTube. I’m not sure which will be my next Gaiman. I guess either Coraline or American Gods. I read The Graveyard Book for Carl’s readalong which is part of R.I.P. VII. If you want to read what other’s thought, don’t miss visiting Carl’s blog for the other reviews. Last week I wrote about chapters 1 -3 of Neil Gaiman’s The Graveyard Book, this week we have read chapters 4 – 6. I’m glad to report that I’m still enjoying the book a lot. The structure is less episodic now, some elements return and we already know that the man Jack who killed Bod’s whole family is still around and hasn’t given up. Bod meets new people in these chapters and one of the most important is a witch. She may be one of my favourite characters and the relationship between the two is quite touching. But there is more. The story of the witch illustrates that there is a very interesting historical dimension to this book which could be overread but it’s present and very well done. The witch is in a part of the graveyard where people lie who have no gravestones, because they were suicides or otherwise cast out by the church. In a place in which gravestones play such a prominent role, to be without one, is like being bereft of your identity. The witch is very sad about this fact and Bod, who is a truly goodhearted little boy, tries to buy her a tombstone. Unfortunately this very nice thought brings not only a lot of trouble but at the end of the whole undertaking, the man Jack is informed that the little baby he couldn’t kill has turned into a boy and is still alive. An element which didn’t strike me at first is how the many inhabitants of the graveyard are often presented. Gaiman gives us the inscriptions of their headstones like in this example “Majella Godspeed, Spinster of his Parish, 1791 – 1870, Lost to All but Memory”. When you’ve read half a dozen of these the effect is quite uncanny. It looks as if all that is left of us is our name, our dates, and -when we are lucky – an inscription that is poetical and wise and not one that is unintentionally funny. In these chapters Bod gets into trouble more than once and what is sad is the fact that it is always when he tries to help others. But we do also discover another side of Bod. He has truly become a person who is able to move between the living and the dead and to use their respective talents. One of the scenes I enjoyed the most is when he uses his skills to haunt two particularly nasty children. I’m looking forward to reading the rest now which will probably be this afternoon. It’s cool outside and rainy, the perfect weather for a book like this. I’m reading The Graveyard Book for Carl’s readalong which is part of R.I.P. VII. If you want to read other’s thoughts, don’t miss visiting Carl’s blog for the other reviews. 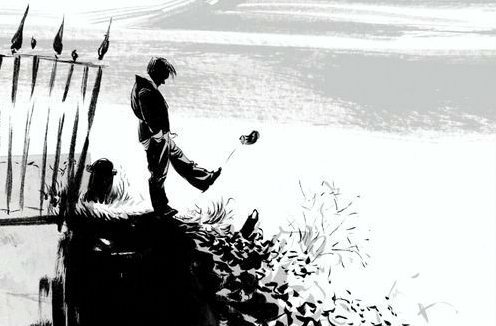 From the very first lines we are drawn into the story of the little boy Nobody Owens and the man Jack who kills his whole family at the beginning of Gaiman’s novel The Graveyard Book. We don’t know why the man Jack kills the little boy’s family, all we know is that he isn’t happy he didn’t get the little boy as well. While he was killing Nobody’s parents and brother, the baby escapes through the door, down a hill and into the graveyard. Mrs and Mr Owens see the little boy and Mrs Owens, although she is a ghost, feels an intense, until now unfulfilled longing and wants to keep the baby for herself. At first there is debate. The other ghosts are not sure it is a good idea. How will she feed him? How will she take care of him? But when the man Jack arrives at the graveyard door and they become aware the baby is in great danger, they agree to protect him and keep him in the graveyard. Luckily Silas, who isn’t really a ghost but no real human either, can move between their and our world and is capable to provide food for the little boy. In the subsequent chapters the boy who the ghosts have baptised Nobody Owens is introduced to the ways of the living and the dead. He learns to read and write, is taught history and other things, makes friends with a little girl, is abducted by ghouls. The story as such, which is inspired by Kipling’s The Jungle Book, is not that special but the way it is told is fantastic. More than a writer Gaiman is a story-teller. He is a very musical writer with an ear for language and it’s not surprising his books work well as audio books. The sentences have a hypnotic quality, they draw you in, captivate you by their sound and their meaning alike. What I thought was particularly great is that we know the man Jack will turn up again. We know his story isn’t over. And we don’t want it to be over. We want to find out why he killed Nobody’s family and what he will do to access the graveyard. The inhabitants of the cemetery may not be corporeal but they still have power. They were able to protect Nobody once, will they be capable to do it again? I can’t tell you how much I like this novel. It’s wonderful, it feels as if Gaiman when he writes is connected to the very source of story telling itself. In an introduction to a short story collection Gaiman wrote that he thinks the only proof a story is well written is when the readers ask the question “What happened next?”. Gaiman certainly achieved this and much more. I’ve bought The Graveyard Book a couple of years ago but never read it. I’m so glad it is part of this year’s R.I.P. hosted by Carl. 38 people have signed up to read along. If you want to read what other’s thought of the first 3 chapters, don’t miss visiting Carl’s blog for the other reviews.